Are you looking for a new and fun way to engage your writers? It is time to cash in on their excitement for all things Easter! Paired with Doreen Cronin and Betsy Lewin's book, "Click, Clack, Peep! ", this fun and engaging activity will not only give your students all the background knowledge they need to be successful, but get them excited to write! The Easter Bunny has left a basket of eggs in your classroom! He knows it is not chocolate inside because he heard a "peep!" from one of the eggs! The Easter Bunny has entrusted your class with the eggs, asking your students to adopt-a-peep! Students will name their peep, create a home for them and even fill out a birth certificate for their new baby duck! 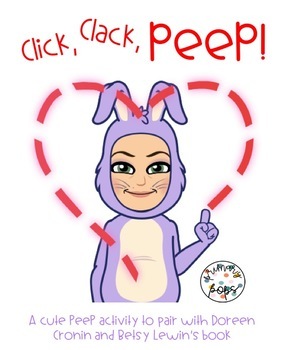 * A poem from the Easter Bunny explaining "adopt-a-peep"
* Each activity includes 2 graphic organizers with differentiated lines for beginner and advanced writers and 2 sets of writing paper for the activity.